It is acceptable size, but that has to be cleaned up. Interesting negotiation nevertheless. Definitely have some mixed feelings about losing park space (even if replaced by the swap), but I like seeing actual density on 104 Ave. Will be interesting to see how this plays out. I like the idea and prefer placing a new park in the middle versus along 104ave. I'm also for this land swap. It will make a nice extension to the existing community garden at 120 st and 103 ave. Since OCL had to demo their existing building anyway, it should make for a great new hub; community league building, gardens and park space. It would be nice to move some of the trees if possible. I agree, some of them should be able to be moved. Don't live in Oliver, so maybe shouldn't chime in - but I'd agree that a high rise versus park on 104 Ave makes sense - as long as land being swapped is turned into as nice, or even nicer park. think the brewery district has had an impact drawing this sort of development? All of the above imo. Everything is right across the steet or within walking distance for daily needs. The project look decent in a prime spot for high res. I welcone a change and development on a parcel of grass that I didn't even know was a park. It's a very good location as is with access to shopping across the street, walkable to 124st, easy into Downtown. With the WLRT that would be hard to beat in Oliver excluding river valley views. Will be a good location in relation to the LRT if there is a station close enough to the building. it is directly across the street from a future planned station. I like the swap. Having the area's park/playground space more in the centre of the neighbourhood (between Jasper & 104 Ave) makes sense to me. Any park/playground area attracting kids right next to an LRT stop strikes me as potentially problematic / future issues. Swap is a terrible idea for the community. There are literally kilometres of sites along 104 ave that could accommodate similar development that aren’t public parks. City owns an entire contiguous block on this site and would be giving that up for I’m not sure what exactly in return. The whole proposal is a result of developer fearmonger tactics and it is insane it has got this far. Unfortunately I would have to disagree. This swap makes a lot of sense for many reasons provided above. ^yup. Agreed. But essentially hastens the closure of Oliver’s outdoor pool. I wonder if we might get a new outdoor pool somewhere to replace it. And the arena is still open, yes? Cause that too would be on the chopping block obviously. My understanding is the new downtown community rink hasn’t been as available to public and MacEwan university as first promised, so I worry this will limit central. ice surface availability. But essentially hastens the closure of Oliver’s outdoor pool. I wonder if we might get a new outdoor pool somewhere to replace it. And the arena is still open, yes? Cause that too would be on the chopping block obviously. The pool and arena are on the western half of the block and don't necessarily need to be closed/chopped. I am basing that on my understanding from the renderings, etc. 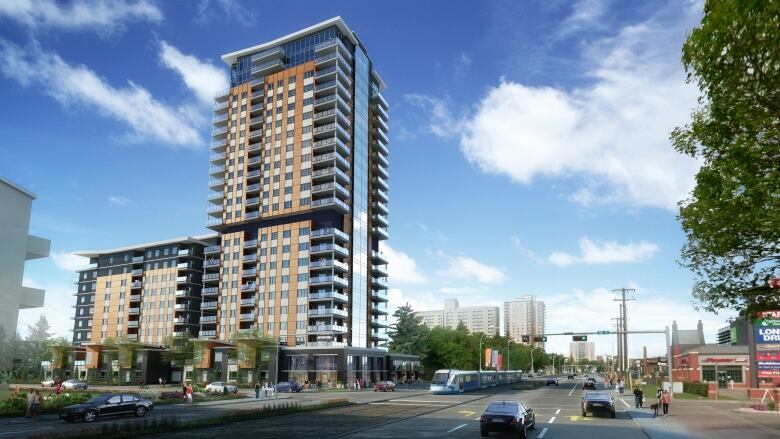 The city website actually says... "...the northeast corner of 104 Avenue NW and 118 Street NW to allow for a high-rise residential tower" which would put it across 104 Ave in the Oliver Square / Brewery District or whatever. I think they meant to say the site is on the northeast corner of the subject BLOCK rather than the intersection. i think it will go through at council. having a tower on 104 is good for TOD and there will be less shadow casting upon residential. a new park off 104 and not on a street that connects to the strip mall, will be quieter and friendlier as well. overall this is a good swap as the city gets a bigger chunk of land in return. kinda sad because oliver park has been there for so long but i think it's a good trade. more high density dev in a central area, and more park space in return. I've lived in the area for about 12 years and I think it's a good trade. Oliver Park has only ever seemed to be a "park" in name only. I mostly thought of it as a place for the arena to dump Zamboni scrapings. Moving it next to the community garden would make it a good complement to the garden, and away from a high-volume traffic route that's going to become a construction zone before becoming a high-volume mash-up of traffic. ^ agree completely. I am also a long time Oliver resident I can't fathom the OCL decision on this. I pass by this "park" on an almost daily basis and in the summer it is hardly used. Parents go out of their way to take the kids to Kitchener park for the water feature or Oliver school for the playground. Who would want to relax right next to 104 Ave.? The OCL of 2019 is clearly not the OCL of 2009 (or when Jarrett Campbell was in charge). ...for record, JC is not in support of the land swap and supportive of the OCL's position. So Jarrett would rather have the park right beside a major thoroughfare instead of a quiet insular part of the neighborhood? My understanding is they want the city to buy the property south of the community garden and have both parks. ^I am quite certain it is south of the community garden. One of the reason to not build there is because of the shading issues. ^You're right, I was upside-down. I deleted my post. This is a false dichotomy. One of the many great things about the Oliver Park site is that 3 of its 4 sides face relatively low traffic streets. So, it could allow for a playground, but could also allow for many other things. This is in stark contrast to the site south of the garden, which has a much more narrow range of uses, and is thus much less valuable to the community. I'd also note the Oliver Park site has had a playground for as long as I can remember (at least 15 years, probably longer) and I have yet to read any news stories about children playing in the park deciding to spontaneously sprint into oncoming traffic on 104 ave. This "land swap" is a cynical developer shakedown, from the which the community stands to benefit nothing. There are literally dozens of other sites along 104 ave that could house this development and for some reason people think it's a good idea to put it on the one single site that's publicly held? It makes absolutely zero sense. It narrows the possibilities of future community amenities in exchange for... a condo tower built by a suburban developer. That people are even considering this as a good idea is completely baffling to me. People keep forgetting that the site south of the garden isn't currently zoned for high-rise development. (This however didn't stop the developer from releasing a bunch of renderings showing a tower designed to cast as much shade as possible on the community garden in an obvious and cynical ploy to drum up fear in the community and thus generate support for this farcical proposal). As an aside, this is one of the many reasons why it's bad for council to say yes to literally every rezoning that comes across their desks. Although, as I said, the land south of the community garden isn't currently zoned for highrise development, residents can hardly be blamed for thinking that council would nonetheless approve a rezoning their given their track record. Last edited by bleppers; 30-01-2019 at 10:32 AM. The city has taken it upon itself to impose a 30kph zone beside every un-fence playground in the event a child does exactly that. Why not on 104 avenue? It is a major artery, so I don't think that is a good idea imo. The ocl was wrong not to endorse the land swap. I understand they want it all, parks in both locations... I just can’t see it. As for Oliver park, it’s always been a dogs breakfast, unless it’s changed there seems to be no commitment on the future of the pool and rink. A large chunk of what is perceived to be park is actually land dedicated for the ocl and a future hall and what’s is actually the park has long been over looked. Paul Kane and the peace garden are far more interesting spaces. I’m sure the swap will happen. the square footage of the existing park (not counting the pool and arena) is about 150% larger than the plot of land south of the peace gardens. does anyone know if there's compensation of any sort for that inequality? I didn't think the development was taking all the land?